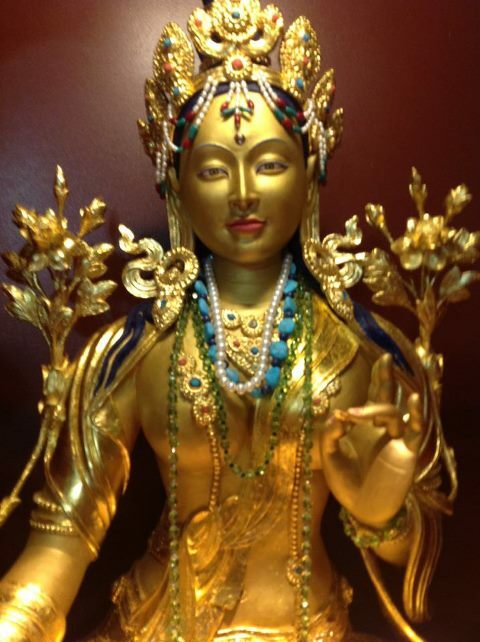 Arya Tara Statue at the LEW Center. 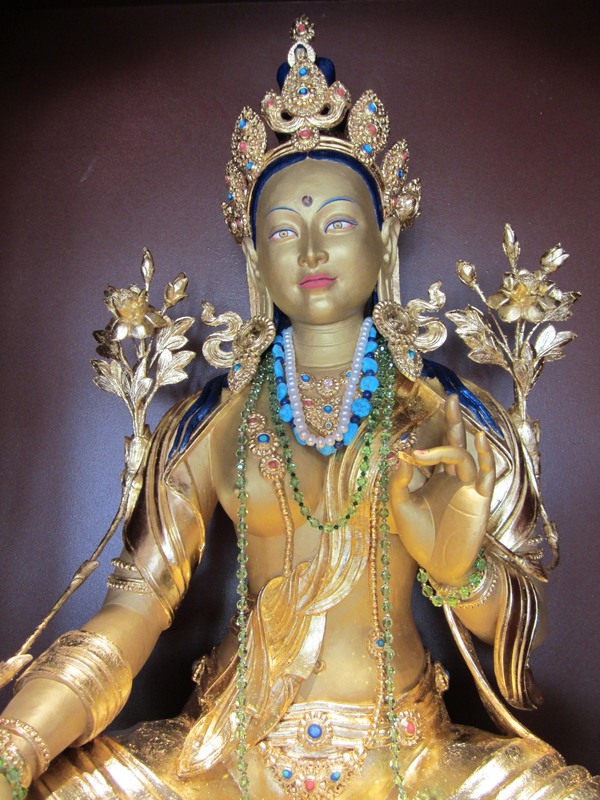 There are 21 praises or supplications to Green Tara and her 20 manifestations. OM! Homage to the Reverend, Noble Tara! Whose field of practice is giving, exertion, peace, patience and meditation. For the layperson, the Arya Tara brings great protection and benefit. Many people recite the Tara Sadhana as a daily practice. The benefits of her practice are written directly in the 21 Praises of Tara sadhana. "To the wise, devoted to the goddess, who recite these stanzas. At evening or upon arising at dawn, who recollect them, Jetsun Tara grants fearlessness, Pacifies all their unwholesome actions, and destroys all lower destinies. 70 million Blesses Ones will quickly initiate the wise; Greatness beyond this is obtained and the wise go to the final buddhahood." If a dreadful poison, whether animal or vegetable, Is eaten or drunk, for the wise who recollect, it is completely nullified The wise are free from the sufferings inflicted by spirits, poisons, or diseases; And as it works or them, it works for other beings, too. If they recite these stanzas clearly, two, three, seven times, By wishing for sons, they will have sons, wishing for wealth, they will gain wealth. They will obtain all they desire, and there will be no obstacles to hinder them." Eliminating the faults of body, you possess the signs and marks of enlightenment, Eliminating the faults of speech, the melody of the kalinga bird, Eliminating the faults of the mind, you know all that is to be known: May we have the good fortune of she who is radiant with the glory of good auspices. Creation of the Arya Tara Statue.